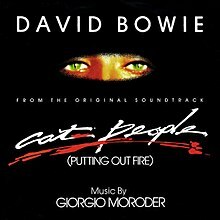 (1982) "Cat People (Putting Out Fire)"
(1982) "Peace on Earth/Little Drummer Boy"
"Cat People (Putting Out Fire)" is a song sung by David Bowie, the title song of the 1982 film Cat People. Recorded in July 1981, the song was written by Bowie with producer Giorgio Moroder. A re-recorded version of the song appears on the album Let's Dance (1983). The director Paul Schrader engaged Bowie for a theme song in 1981, with Moroder having already recorded most of the music. Bowie was to put lyrics to the main theme. The B-side is a Moroder-only instrumental which featured no input from Bowie. The song itself, in keeping with the dark tone of the film, has some slight goth rock influences, with Bowie singing in a deep baritone croon while being backed up by a female chorus. Because of Moroder's contract, the single was issued by MCA. The full-length 6:45 version appeared on the soundtrack album, and the 12" single, while a 4:08 edited version was made for the 7" release. The single reached No. 26 in the UK, No. 13 in Canada and No. 67 in the US - Bowie's biggest hit there since "Golden Years". It peaked at No. 1 in New Zealand, remaining there for three weeks, as well as in Sweden for four weeks. It was also No. 1 in Norway for seven consecutive weeks, and then returned to the top for a further week. The single was released three separate times by MCA, first in March 1982 with "Cat People" as the A-side, then again two months later with "Paul's Theme" as the A-side, and finally in November 1982 with "Cat People" back on the A-side. Hungarian-born composer Sylvester Levay contributed to the orchestration. In December 1982, Bowie re-recorded the song for his album Let's Dance, released the following year. This version was also released as the B-side to the title track's single release, and performed on Bowie's Serious Moonlight Tour. He had originally planned on using the original version of the song, but Moroder's label MCA Records refused to license it to EMI America. In the re-recorded version of the song, Stevie Ray Vaughan provided the guitar solos and riffs in the song. The song was used in the 1998 film, Firestorm (1998 film). In 2009, the track was used in the film, Quentin Tarantino's Inglourious Basterds and in 2017, the track was used in the film Atomic Blonde. In 2009, the song was used in a scene of The Office, episode Cafe Disco. Sharleen Spiteri recorded a new version of the song in 2010 which was included on her album The Movie Songbook. The full-length version of the original 1981 recording appeared on the compilation Bowie: The Singles 1969-1993 in 1993, on the 2003 edition of Bowie's Sound + Vision collection, and on Re:Call 3, part of the A New Career in a New Town (1977–1982) boxed set, in 2017. The shorter version of the original 1981 recording appeared on the compilations Best of Bowie (US/Canada, Germany/Switzerland/Austria, Denmark 2002) and The Best of 1980/1987 (2007). The Let's Dance version recorded in 1982 was released as the B-side of the single "Let's Dance" in March 1983. Remasters of the Let's Dance version of the song have been included in reissues of that album, most recently in a 2018 remaster of the album included in the box set Loving the Alien (1983-1988) (2018) and released separately the following year. A concert performance recorded on 12 September 1983 may be heard on the live album Serious Moonlight (Live '83), which was included in Loving the Alien (1983-1988) and released separately in 2019. The performance was filmed and appears on the concert video Serious Moonlight and the DVD version of Best of Bowie. ^ "Image : RPM Weekly". Retrieved 21 February 2016. ^ "norwegiancharts.com". Retrieved 23 November 2008. ^ "swedishcharts.com". Retrieved 23 November 2008. ^ "hitparade.ch". Retrieved 23 November 2008. ^ "everyhit.com search results". Archived from the original on 18 July 2007. Retrieved 23 November 2008. ^ a b c "Billboard charts at Allmusic". Retrieved 23 November 2008. ^ "A NEW CAREER IN A NEW TOWN (1977 – 1982) - David Bowie Latest News". DavidBowie.com. 22 July 2016. Archived from the original on 30 May 2014. Retrieved 29 September 2017. This page was last edited on 16 April 2019, at 07:29 (UTC).